Well, the Big Paper is due on Wednesday, so as soon as that’s in I’m sure there’s going to be a whole lotta new stuff going on around here! Although, I still have to study for finals…shhhhhh. Anyway, I did finally manage to finish a Whitby sock. Shown sans grafting, which of course I did just after I took the picture. I managed to screw up one of the repeats in the foot (and anyone who has knit these knows that’s nearly impossible!) but I didn’t notice till after it was done. Oh well, it’s staying now. I’ll replicate it on the second sock. And a new skein. Blue face leicester. This is much heavier than my usual for some reason – it’s 100g and only 130 yards. I usually get over 200 at least. It’s not much thicker than my usual worsted weights (although it is, by a bit) but I think the real difference is that I didn’t really predraft. So there’s not as much air in there, thus it’s denser. But I kind of like it, it’s heavy and seems like it’d be hard-wearing. Tightly plied, since the singles were pretty tightly spun. Aaaaand…it’s striping! Quite long repeats, 2 of them, with some blending areas between. 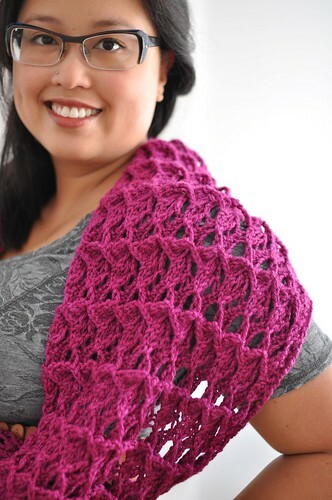 There are only 6 colour changes (3 colours x 2 repeats) so it’d be more like a gentle fade. Apologies for the blurry photos; I’m feeling a bit blurry myself at the moment. Time for bed! Good luck with the paper and the finals! I love your Whidby socks, especially the color. I made them in the recommended brown (creative, I know) for a male friend, and they looked, well, masculine. Clearly you have more vision than I do! Also love the weaving – so fun to see where that’s going to go! I just got back from a trip to visit a friend’s parents in Scotland – her mom is a weaver and has all these rugs made out of old clothes. Gorgeous and awesome, and so fun to watch them pick out a skirt they wore 10 yrs ago. You’re going to feel that way about your yarn leftovers! nice socks and nice spinning! I love those socks. I love socks in general, but these are awesome. Beautiful sock! They look very soft and cozy. The Whitby looks great! And I love the colors and texture of that yarn you spun. Your spinning looks beautiful, love the colours and the twist. The spun yarn is wonderful! I love the color combinations and the texture it has. Great job! You have such good color sense. I love the colors of the sock and that yarn.